Nano coat aluminum composite panel is designed and manufactured by making improvement on the PVDF ACM. In addition to common features of PVDF aluminium composite material, Nano coat ACP has advantages that it is pollution resistant, acid and alkali resistant and it has good self-cleaning capability. In a word, the Nano coat aluminum composite panel is much easier for cleaning due to its Nano PVDF coating. The coating of Nano coat aluminum composite panel features superior flatness, color and gloss retention, and resistance to water and solvent, etc. For instance, through testing by specular gloss meter according to ASTMD523-89 standard, we learn that the panel surface gloss is 85%. Practical experiments show that our Nano coat ACP won't prone to produce any change on its surface after 100 times of continuous washing with MEK or after 240 hours non-stopping washing with Neutral lotion. Thanks for your visiting of the website constructed by Litai, a NANO coat aluminum composite panel manufacturer in China. All our composite materials are made according to ISO9001:2000 international quality management standard, so we are able to provide CTC, CE, and SGS certified advertising ACP, mirror ACP, and building ACP, etc. 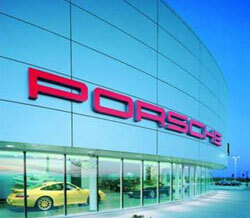 We can also offer OEM service. We welcome worldwide clients to do business with us. 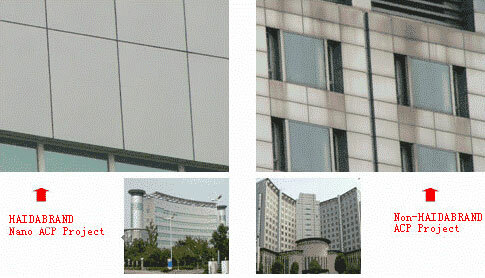 FEVE ACP In addition, FEVE ACP is characterized by high surface hardness. Its pencil hardness is over 4H.